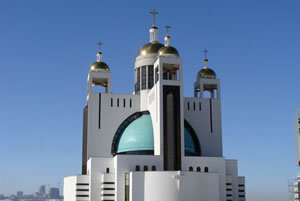 The new Cathedral of the Resurrection of Jesus Christ in Kiev combines traditional design with contemporary features. The four gilded domes represent the four evangelists. These surround a larger, central dome, which represents the figure of Christ. The cathedral has the capacity for a congregation of 1500 and now completed it has become the spiritual centre of the Ukrainian Greek Catholic Church. Noted Ukrainian architect Mycola Levchuk designed the structure, which took the top prize for contemporary building designs for religious structures at a recent architectural design contest in Moscow. The construction of the lower large dome was one of the major challenges to the project. The diameter was 22m and the top of this dome was 26m above ground level. It had to be watertight and insulated and the inside surface had to be smooth enough to allow elaborate painted scenes. The novel solution proposed by the contractor involved initially constructing a structural steel dome. A large formwork section representing a quarter of the dome was then fabricated from timber and plywood and hoisted into position with the help of two hoisting units. This formwork section was enormous with a surface area of over 80m2. The timber used had been covered with special coating to give the required high-quality finish. The spraying of the GRC raised many problems that had to be overcome. GRC is normally sprayed under factory conditions with a trained workforce. In this instance the spraying was 16–26m in the air with a workforce unused to the material. Initially a trial section of formwork was installed at ground level and this was used for training. During the training, pumping trials were carried out and it was found that the Power-Sprays PS9000A spray station could be sited at a height of 15m and had the capacity to pump the cementitious slurry up to the required 26m. This overcame many problems as the GRC 125 mixer, the spray station and all the raw materials could be easily accessible at this 15m level. Each dome section would weigh about 9 tonnes when completed so it was essential that the connection between the GRC and the structural steel was adequate in terms of safety and security. It must also be designed to allow sufficient movement to accommodate shrinkage and moisture movements within the GRC skin. A special fixing was designed to achieve this and after testing was used in the project. Spraying could now proceed. Due to the high-quality finish required, a mist coat was sprayed first followed by the GRC spraying. When spraying under these conditions it is essential that the alkali-resistant glass fibre runs freely through the spray gun without blocking and is easy to compact. High zirconia NEG ARG AR2500H103 was chosen as it met all these criteria as well as having the highest available (19%) zirconia content. Particular attention was paid to compaction and even under these difficult site conditions the quality of the GRC produced was comparable to that produced under factory conditions. With the quantity of GRC to be sprayed, each section took a full day to spray and the formwork was left in place a further day before being moved to the next section and the process repeated. 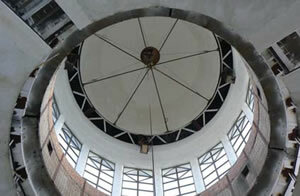 The remaining sections of the dome were then finished, which allowed the insulation and waterproofing to be completed. 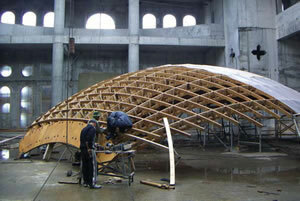 To finalise the project a smaller 8m-diameter dome was produced. This was manufactured in one piece at ground level and was a major undertaking. The surface area was 100m2 with an average GRC thickness of 18mm, giving a total weight of 3.7 tonnes. After spraying and curing, the dome was lifted from the formwork and hoisted 47m high, passing through the opening in the top of the large dome. It was then fixed onto eight corbels located just below the central gold dome. The smooth internal surface of the GRC was ideal for decorative painting. The successful completion of this project was a remarkable achievement for all concerned but most of the credit must go to the workforce and the late project manager and author of its major engineering and technology solutions, Sergei M Popov.